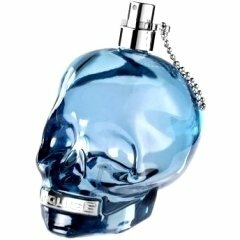 To Be (Eau de Toilette) is a perfume by Police for men and was released in 2011. The scent is synthetic-spicy. It is being marketed by Mavive. To be sweet and cheerful! I'm wearing this scent today and the first thing I've got to say is that this is not an aquatic or freshie, despite what the watery blue colour of the liquid and the top grapefruit note may lead you to believe that. I know the term synthetic is perhaps overused but I think it's quite apt here, for me it's one of those fragrances that hits me in the throat right from the off and isn't all that pleasant to wear. It looks a lot of fun with it's skull shaped-bottle but the initial fresh grapefruit blast opening (sadly for a freshie lover like me) quickly mutates into a synthetic pepper heavy blast! I'm a fan of the presentation the bottle really looks great (if kind of gimmicky!) especially in this alluring shade of blue but the scent makes me picture purple or perhaps even a gold, or both! Police To Be is a fun & youthful nighttime/party fragrance, to a certain extent it recalls scents like Boss bottled, One Million et al, just not as spicy as some of those and with a touch more freshness. It even makes me think of something that the house of Jacques Bogart might produce, as it is certainly strong and has that trademark sweetness. Apart from the harsh synthetic peppery opening (the grapefruit vanishes almost immediately to my nose) the dry-down is quite linear, it stays sweet & floral (violet & amber) with a little spice thrown in to the mix. I think it could get quite cloying on hot days. There's not really much left to say about this one, apart from the fact it does seem to last a long time and project well too, so it presents great value for money given the prices it can be found for, especially online. Right now I can't see myself wearing this one a lot, even as a dumb grab, but I'll keep it in mind for when the days start to become colder again (which is a long way off!) as I think it would be more suitable (and perhaps even kind of appealing) then. As you spray it, the scent comes really really soft, making you even think that the reviews you read about it were wrong, talking about nice sillage and projection. Then, during the drydown, the magic starts, and the fragrance begins to grow. I liked the smell, it's a fresh-sweet, and not that fruity-sweet type. Honestly I can't feel the woody notes it's supposed to have, but it pleases me, nonetheless. About the bottle, it's beautiful and interesting, but it's dangerous, as you may let it fall if you're handling it with wet hands.